The Composers of Doctor Who: Raymond Jones | Warped Factor - Words in the Key of Geek. Curiously, as we continue poking around the music room aboard our TARDIS, we come to a juncture at which we know more of the history of the period our next composer was tasked with providing a soundtrack to than the man himself! For comparatively little appears to be known of Raymond Jones, the man who scored both The Romans & The Savages for those crucial early years of Doctor Who. A look at Carry On Cleo, released a year prior to the broadcast of The Romans, might just reveal Ray's inspiration for the score to a story which is on the surface implicitly modelled on it! 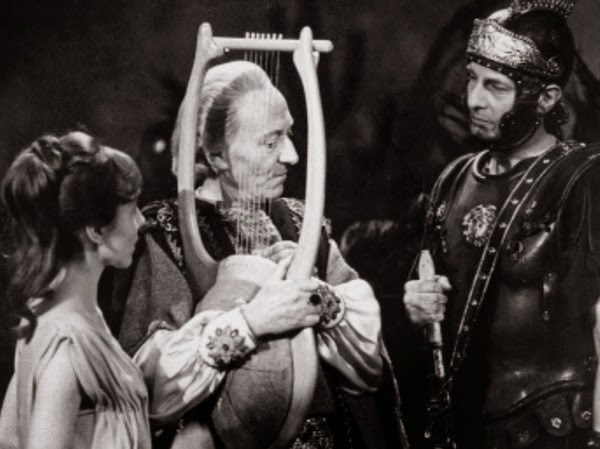 For is not Derek Francis' Nero a watered down version of Kenneth Williams' Julius Caesar, or Sid James' Mark Antony, Jacqueline Hill's Barbara Wright the object of his lusty gaze just as Amanda Barrie's depiction of the famed Queen of Egypt was for her two suitors? "Dr. Rózsa based some of the score on Greek, Jewish and other ancient sources. To add further authenticity to the music that accompanies Quo Vadis, Dr. Rózsa included in the orchestra many of the ancient instruments that were heard by the Romans during the reign of Nero." 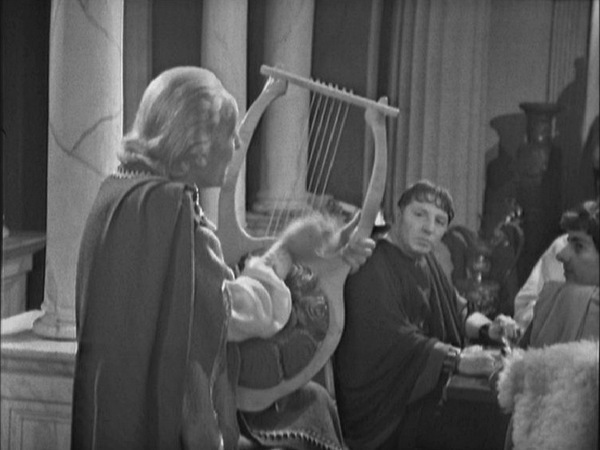 One of which becomes a key plot point of The Romans, after our crotchety old/young hero is mistaken for the lyre player Maximus Pettulian! CENTURION: Is that your lyre? DOCTOR: Why? Why, have you lost one? CENTURION: No, no, only if it is yours? DOCTOR: And what if it is, hmm? CENTURION: Why, it's you I'm looking for. DOCTOR: Oh. Oh, I see. Yes. CENTURION: You must be Maximus Pettulian from Corinth, whose skill as a musician is talked of even in Rome. CENTURION: We expected you in Assessium yesterday. When you failed to arrive, I sent my men out to search for you. I count it my good fortune that I've personally found you unharmed. DOCTOR: If I am the man you're looking for, tell me why should I be harmed, hmm? "The lyre, borrowed from the Greeks, was essentially an early harp, with a frame of wood or tortoise shell and various numbers of strings stretched from a cross bar to the sounding body. The lyre was held or cradled in one arm and hand and plucked with the other hand. The Romans gradually abandoned this instrument in favor of the more sophisticated cithara, a larger instrument with a box-type frame with strings stretched from the cross-bar at the top to the sounding box at the bottom; it was held upright and played with a plectrum. The strings were tunable by adjusting wooden wedges along the cross-bar." And the Doctor will be given a chance to demonstrate that, sort of, later, though he goes all highbrow music critic on us, hailing but one simple strum as a stroke of genius. Pretentious, no? DOCTOR: Beautiful, beautiful. Did you not hear that, my child? That instant composition? VICKI: Oh, yes, er, Maximus. Could you play it? DOCTOR: Me? Well, I'll try, that is, with Caesar's permission. "...staged musical contests, which gave him further chance to demonstrate in public his talent for singing while accompanying himself on the lyre. In an age when actors and performers were seen as something unsavoury, it was a moral outrage to have an emperor performing on stage. Worse still, Nero being the emperor, no one was allowed to leave the auditorium while he was performing, for whatever reason." A detail which Spooner may well have drawn on in having Nero develop a massive hissy fit at the fact his guest is implied to be a better musician than he. "Thank you! You are all so kind. With Caesar's permission? I would like to play my new composition in honour of this occasion. The music is so soft, so delicate, that only those with keen perceptive hearing, will be able to distinguish this melodious charm of music." Roman ears were indeed perhaps inevitably a lot more cultured than they're presented here, their ability to adapt ideas from other cultures a key point of Tribunes & Triumphs' appraisal. "One of the most important attributes of the Romans was the ability to assimilate ideas and customs from the cultures and societies which they encountered. Roman music and their musical instruments were therefore highly influenced by the Greeks. Roman music was used at a variety of different occasions: during processions, at weddings and funerals, at public spectacles such as the games at the Colosseum, religious ceremonies and public performances." And while Ray's own attempt at assimilation is somewhat less formal, more of a light-hearted romp in keeping with the desire to try comedy (indeed William Hartnell was reported to be delighted to have the chance to show off his comedic side post-Carry On Sergeant) it seems a real shame we know so little of the man polished enough to tackle the tuneful side of things.